In an unprecedented ecumenical gathering at Lambeth Palace hosted by The Most Revd Justin Welby, Archbishop of Canterbury, and initiated by His Grace Bishop Angaelos, General Bishop of the Coptic Orthodox Church in the United Kingdom, a joint statement was agreed by leaders and representatives of the Churches of the Middle East and the wider Christian Church in Britain. The meeting began with a round table discussion regarding the plight of Christians and minority communities in Iraq, Syria and the wider Middle East. A joint statement was then agreed, expressing solidarity with, and advocating for, all those who continue to suffer gross violations of the fundamental right and freedom to practice their chosen faith. The round table discussion was followed by a service of prayer to give thanks for Christians in the Middle East and to remember all those who have lost their lives or continue to suffer persecution. A short press briefing followed. It is incomprehensible and unacceptable in the 21stCentury that our sisters and brothers in the Middle East face intimidation and death for exercising their freedom of religion or belief, or merely being of a certain ethnic background. We have gathered today as leaders and representatives of Churches in the Middle East within the wider Church in Britain to stand in solidarity with those who are persecuted for their Christian faith, as well as all who fall victim to injustice. We have spoken in one voice, calling for the continued support of Christians and minority groups across the Middle East, and pray protection upon them while they remain steadfast in the face of unimaginable challenges. When you are looking at the murder and the slaughter of vast numbers of people there is never enough in terms of coverage, and it is easy to forget that is part of a global process of immense suffering. I think in looking at the Middle East we hope that the media will not move on quickly but will continue to remember those who are suffering so greatly. A new situation has arisen which creates a state of emergency in the Middle East for Christians and other religious and ethnic minorities. The recent increase in violence and aggression has resulted in gross violations of fundamental rights and freedoms in the region. We gathered today as Christians including those originally from the Middle East to stand in solidarity and prayer with our brothers and sisters who seek to practice their faith and belief in lands where they have been a continuing presence for centuries. The Middle East is the birthplace of Christianity, and home to indigenous Christian communities that have been an indispensable part of its history. Despite the challenges, Christians in the region were and are a stabilising and reconciling presence. Today, particularly in Iraq and Syria, they are at great risk from violence fostered by extremist ideologies which no longer see them as being part of the future. The Middle East is in desperate danger of losing an irreplaceable part of its identity, heritage and culture. We are seeing an extreme religious ideology that knows no limits in its persecution of those who are culturally or religiously different. Those who promote this intolerance must be challenged and the perpetrators of violence held to account. The suffering of those who bear the brunt of its terror requires us to act and bear witness to their plight, whatever ethnic group or religious minority, they come from. We must provide relief and safety for those displaced and in fear of their lives in consultation with our partners in the region. We must also bring pressure to bear on those who can provide security to those affected. In meeting and praying together, we give thanks for our brothers and sisters as they continue to live their Christian faith with strength and perseverance. We commit to continue to stand with them in prayer, to speak for freedom from persecution for Christians and all other religious communities and those of no faith who live as minority groups across the region. We also continue to urge Her Majesty’s Government to work within the international community to safeguard and provide for all those affected. 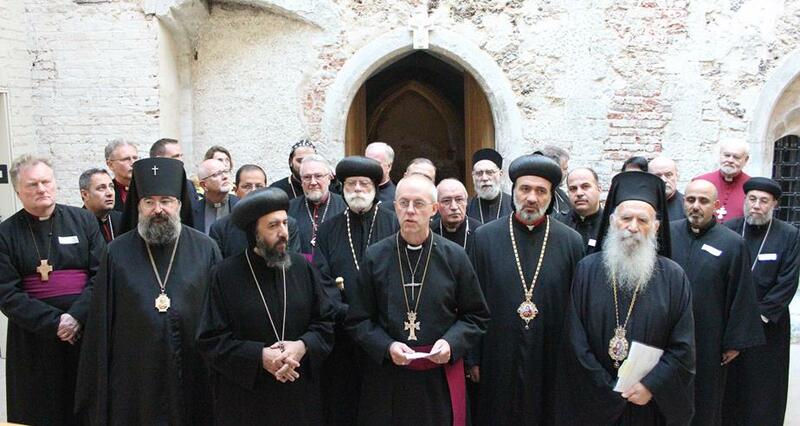 0 Comment(s) to the "Press Release: Unprecedented meeting of Middle East Church Leaders and the Archbishop of Canterbury at Lambeth Palace"